What a spectacular weekend! Not only did I get the chance to meet our Blogging friend Randy (Barrister’sBlock) and her DH, but she also accompanied Cyndi and I to the AQSG regional study group meeting in Shelburne, VT. 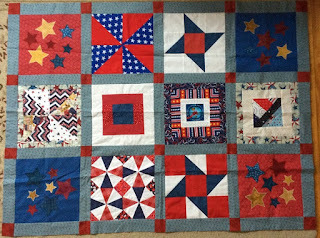 I have mentioned many times how fortunate I am to have a good friend (Cyndi at Busy Thimble) who owns the best quilt shop in the universe. As much as I love visiting Cyndi whenever I can, I love it even more when I can share it with someone new. Our plan was to visit the shop first thing Friday morning and then head out to the meeting in Shelburne after an hour of shopping. After a little over 2½ hours of drooling and shopping, we finally made it out the door! Here are a few of the treasures we saw at the Shelburne Museum. 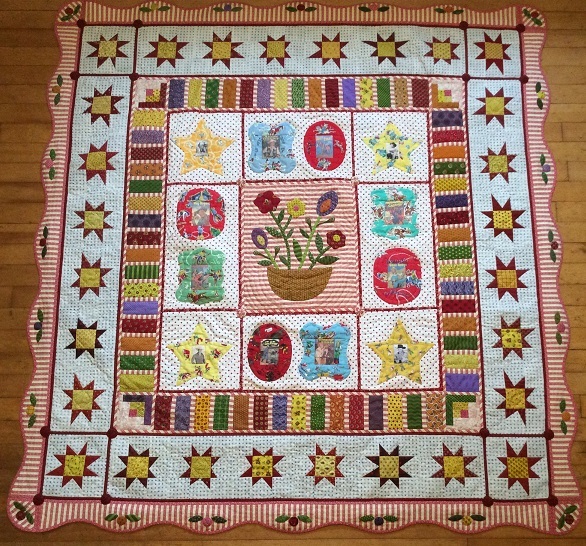 The staff was warm and welcoming and shared some fabulous quilts. We also made out way down to the Hat and Fragrance Hall for a showing of more spectacular quilts. I had not been to the museum since 1994. I surely won’t wait that long for my next visit. 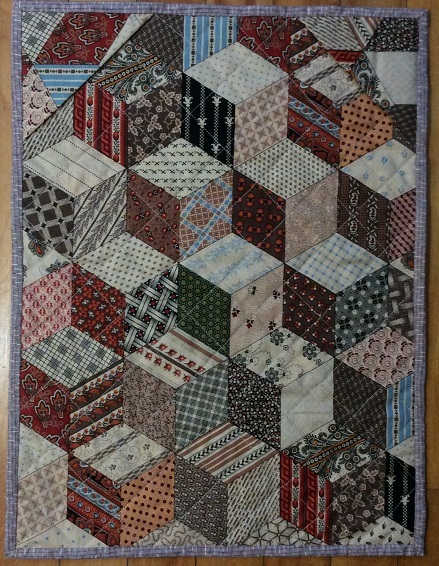 this was a "potholder quilt" (right up my alley!) done in circles! Yes, all those circles are completely bound and then whipped together with the setting blocks. I've done hexagons and diamonds, now I'm going to try it in circles! this was a delightful quilt with stuff work and the words to the Star Spangled Banner quilted into it. I have loved this "stonewall" quilt forever and finally got to see it close up. And this quilt from North Adams, MA has always been one of my favorites. What a treat to see it in person! And the show and tell was amazing too. Here's Randy drooling over a fabulous spread belonging to Sharon Waddell. Absolutely breathtaking fabrics in this one! Thanks Sharon for bringing this to light! 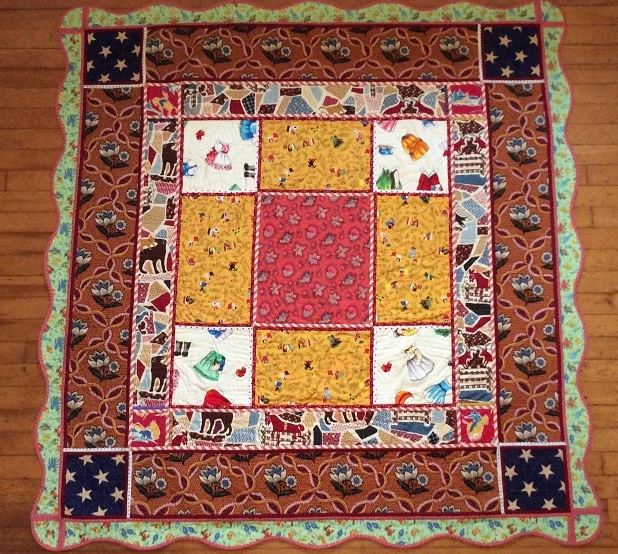 I have been a member of AQSG (American Quilt Study Group) since 1986. I served on the board from 1989 to 1993. I love being part of this group of diverse, yet like-minded people who have helped to put quilt scholarship on the map. Thanks go out to Marge Farquharson and Anita Loscalzo for organizing such a wonderful event. 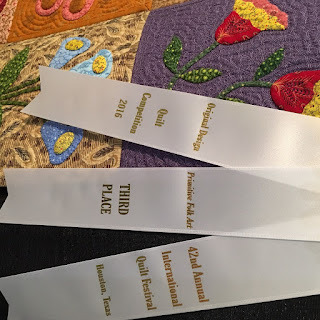 My one regret of the weekend is that we got so wrapped up (pardon the pun) in the quilts that we forgot to take a photo of the 3 of us together! Come back soon Randy! 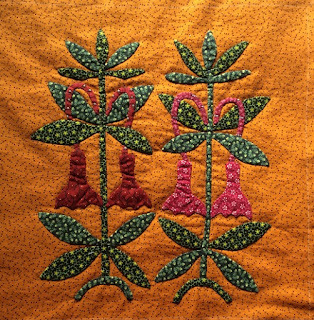 October’s Shenandoah Valley Botanical Applique block “King’s Crown” is appliqued, but not yet quilted. I seem to be just a bit behind this month. It’s been a crazy few weeks. After all this craziness, you can imagine my disappointment this morning when I reached the bottom of the potato chip bag (what? You have never had potato chips for breakfast???) and realized that they had forgotten to put the promised “golden ticket” ($5,000.00) in the bag! I will now have to adjust my budget for the upcoming trip to Vermont! Cyndi (Busy Thimble) and I will be heading to Shelburne, VT to the Fall AQSG study day. Randy (Barrister’sBlock) just happened to have a trip to Maine planned for this week, so she will be going as well. Woohoo! We’ve been blogging friends since before I started mine and I can’t wait to meet her in person! I hope some more of my NE blogging friends will be making the trip as well. I’m keeping my fingers crossed for you Cynthia (Wabi-Sabi Quilts)!!! Have a great quilty day. So, I joined Randy’s (Barrister’s Block) pin cushion swap and look what I received from Deb in Canada. I can’t imagine a better pin cushion for me than this beauty. Don’t you love it? And, she put this wonderful “Maple Leaf” flag of Canada on the back which is so perfect for me because my grandfather was from Nova Scotia. You can see I have already put it to good use, right beside my evening work station. And as if that were not enough, she tucked in this great charm pack of Barbara Brackman’s Morris fabrics. Oh yum! Thanks a million Deb! I was overjoyed to find out that Randy picked Kevin (Kevin the Quilter) as the recipient of my pin cushion. He is so full of energy and has done so much for the quilt world with all his enthusiasm. 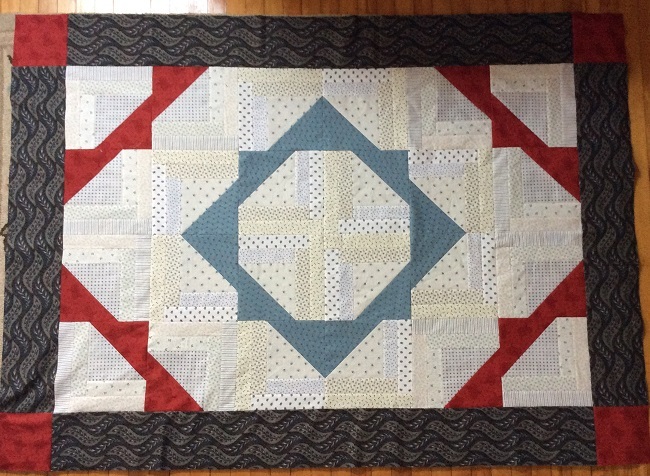 Among all his other accomplishments, Kevin has made and distributed hundreds of quilts for Veterans. He has recently moved to a new home where he now has chickens. So, my first thought was this ever popular chicken pin cushion. Luckily he posted about his first quilt day at his new abode (read about it here) with fellow quilters and he had made this very pin cushion for all the participants. What a hoot and what a lot of work! So I started to think about what to make. This is the first one I came up with. Years ago my friend gave me some vintage donut cutters and I love them for storing my bobbins in. I just filled the center with wool and voila, a pin cushion and bobbin holder! 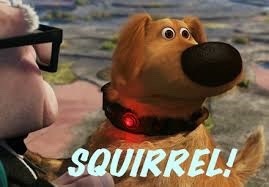 But that seemed too simple to me and way too boring. I wanted something with color so I made this little wool one and filled it with crushed walnut shells. I did not make a separate liner, but I did line both sides with a thick 100% wool piece of batting. This lets the pins slide in nicely and keeps the crushed shells where they belong! And, I don’t think you can have chickens without a “darning egg” so I dug one of my many vintage eggs out and it will travel on with the rest of the gang. I had a ball doing this swap! Thanks Randy! Well, here it is. 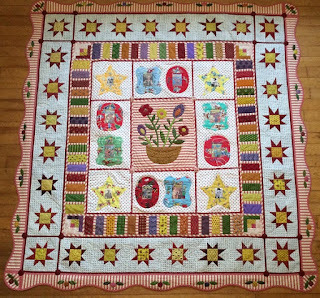 The final border in our “Gwennie Inspired Medallion Sew-a-long”. When I chose the “something fishy” theme for this final round, I had something else in mind. In actuality, I couldn’t make it work so I decided on a simple “scallop” shaped border. I felt like I was cheating so I found this cute little “marine life” fabric for a backing and then I felt more like I was complying! Because I did this in the “potholder” method, it was a bit of a challenge (I’m not that good with math) to get that scallop curve to come together perfectly (well, close enough anyway) at the corners. 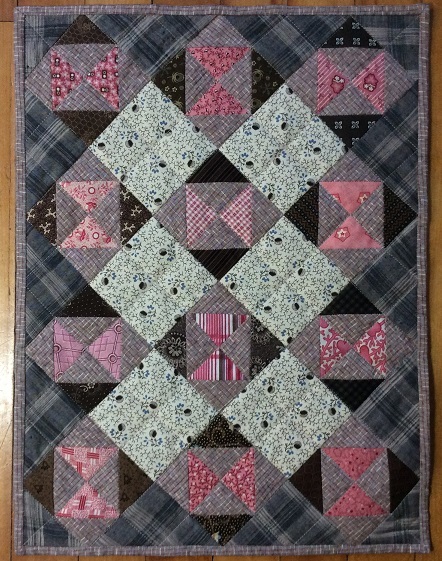 It now fits nicely with all my “good enough” quilts and I love it! 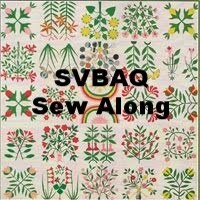 I had a lot of fun with this sew-a-long and I have thoroughly enjoyed seeing all the different interpretations of each theme. 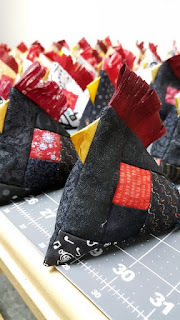 I learned a little about improv and how to “try” to let go of my usual perfection (wink) and I learned a lot about how the potholder method works in a medallion style. Thanks once again to all my partners in crime (Lori, Cynthia, Cathy and Katy) and everyone who participated for all the inspiration and motivation! So much creativity! If I could reach out there, I would pat you all on the back – good job! 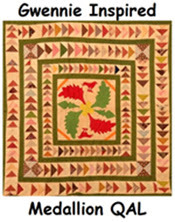 Lori is doing the link up this month (here) so don’t forget to stop by and see all the beautiful quilts.